Every year the scientific value of the SGEM papers is increasing more and more. That is why, we bravely could call SGEM GeoConference - 'Probably the best in EU'. The power of our idea is to gather all geoscientists together and stimulate them to collaborate, exchange ideas and scientific experience. We believe that Science is the most powerful wheel in the big machine of human progress. We appeal to innovate and share knowledge with each other! SGEM Conference Committee is doing their best to make our authors and their papers visible and accessible from almost anywhere on the web - because authors' impact is our greatest priority! Papers from the SGEM Conference Proceedings are indexed in ISI Web of Science database. All papers from the last 9 years are submitted to Web of Science database - Conference Proceedings from 2008, 2009, 2010, 2011, 2012, 2013, 2014, 2015 and 2016 already INDEXED. We are very proud to have 8306 papers indexed in this well-known database and as a result the hi-index of the SGEM title grows up to 8. We are proud that in 2010 the Scientific Committee of the International Conference SGEM has been invited from the ELSEVIER General Manager to give their approval for covering the SGEM proceedings in the Elsevier products - SCOPUS and Engineering Village Compendex. We are happy that papers from 2005 and onward will be included in these distinguished scientific databases. More than 6613 SGEM papers (from 2005 - 2016) are indexed and online visible via SCOPUS and COMPENDEX databases. 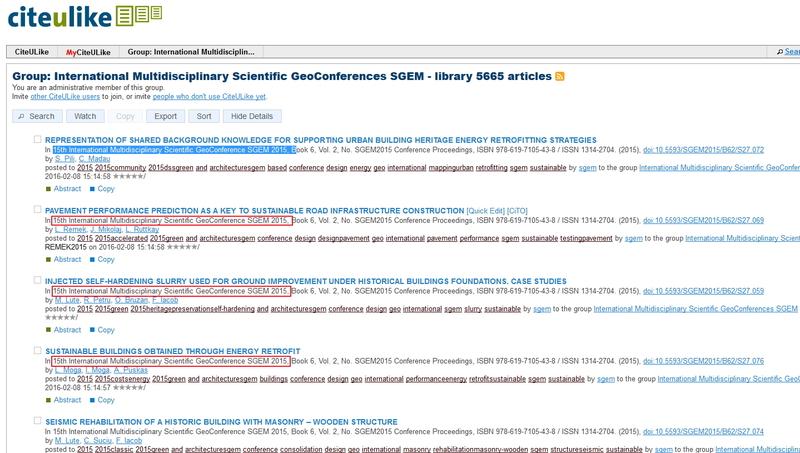 SGEM Scientific GeoConference is a licensed partner of EBSCO Publishing Inc (since August, 2012). Papers from the 2008 -2015 are already available through out the EBSCOHost on-line database. 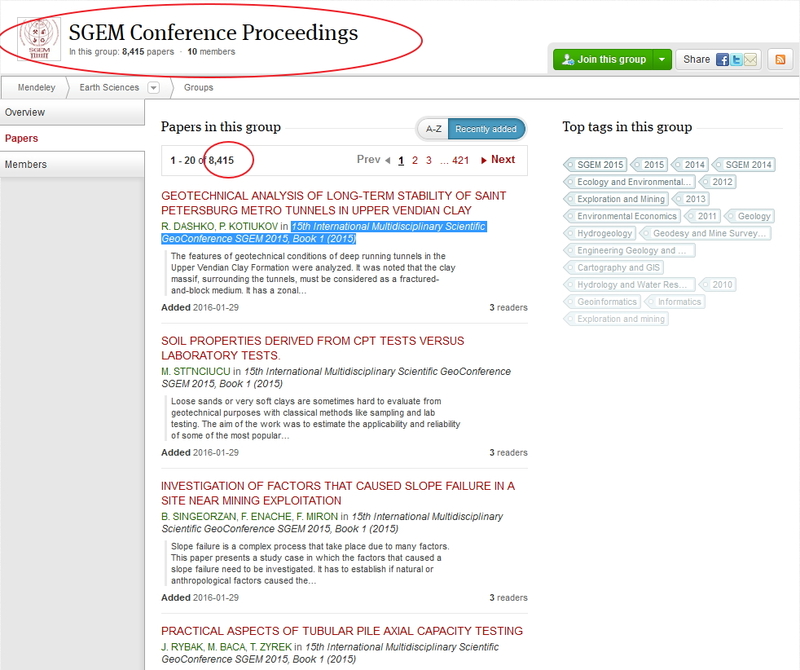 We are proud that SGEM Scientific GeoConference has a signed contract with ProQuest Publishing, dated 20th of January, 2012. Every year papers published into the SGEM Conference Proceedings are officially accepted for uploading into the ProQuest database. SGEM Scientific Conference is a voting member of CrossRef. SGEM Scientific Committee is responsible for generating DOI of each paper. It has become a tradition the Scientific Committee to send a complimentary copy from the SGEM Conference Proceedings (+ CD version) to the British Library. 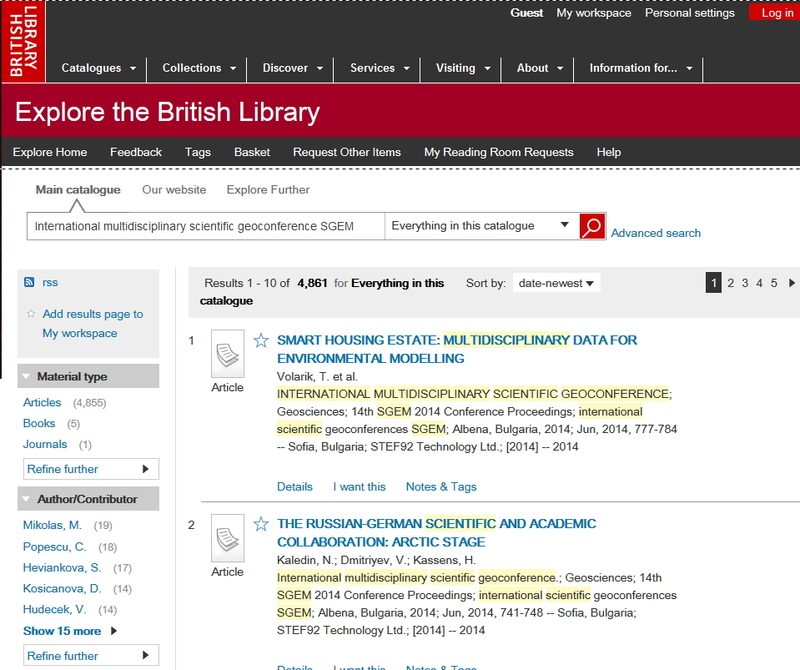 We are very proud that SGEM Conference books have their worthy place in the British Library catalog, among the other distinguished issues from all over the world. Want to see published papers in the conference proceedings? VISIT the SGEM Online Electronic LIBRARY!